My two boys couldn't wait for summer to start. Being outside, playing in dirt, water and things that made them take a bath every night. My plan this year was to visit as many parks within this city. My only cost was food and gas. I live on the west end of Edmonton and there are a 6 playgrounds within a 10km radius of our home. 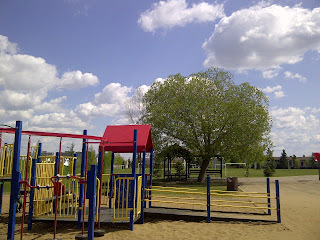 I also found 2 spray parks that the kids love. I have a routine that my kids enjoy and don't have the tantrums that usually accompanies leaving a fun attraction. 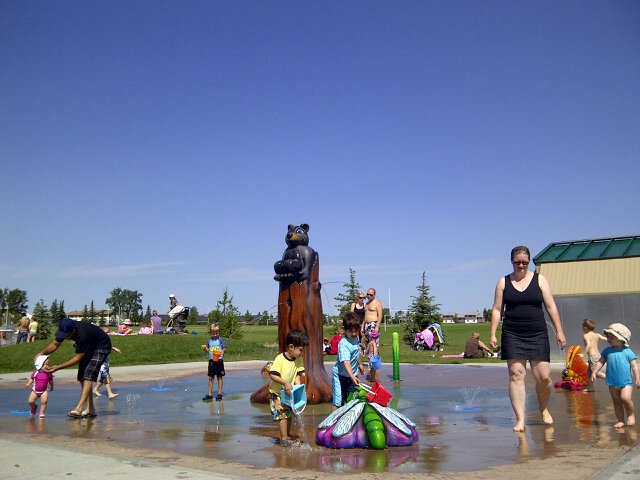 You can find all the spray parks in Edmonton on the city's website. After breakfast, I prep a light lunch and lots of snacks and drinks. I pack it all in a bag with a small blanket and a change of clothes. I keep a few towels in the car as well as a camping chair. I get the boys dressed and head out the door. We've gone either to the playground or spray park. The kids don't mind which they go to. After playing for an hour or two I pull out the blanket and set a picnic. My kids think this is the best invention ever "eating outdoors". They eat, then play a bit more. When they get a little droopy or it gets close to 2pm , I tell them that it is time to go. They are happy to veg out in the air-conditioned car on the ride home. But what do I do when the weather is crappy you say. Well the Library is fun. They love "checking out" their books using the automated system. We have also gone to toy stores to "demo" toys. The local Chapters/IndigoKids also has a play area set up for kids. I love this one because during the summer they have mini camps that the toddlers can join. They make crafts, have scavenger hunts and so on. I have often scheduled trips to the grocery during this time to get them to pick out fruits and veggies they want to eat. Also Safeway and Sobeys give the kids a cookie while they shop. I also bring them along to errands like the hardware store or craft store. If we don't buy anything, they don't care as long as I say we are heading on an adventure. Kids love that word. How are your adventures going this summer?